Shirley J. Brewer, After Words, ISBN 978-1-934074-82-4, Apprentice House/Loyola University, Baltimore, Maryland, paperback perfect bound, 50 pages, $9.95. Here is a dramatic and heartrending collection of poems written about the stabbing death in Baltimore of researcher Stephen B. Pitcairn, who planned a career as a doctor, two days before the young man’s 24th birthday. Pitcairn was fatally stabbed in the heart in a mugging one night in July 2010 on St. Paul Street, a block from Brewer’s home in the city’s Charles Village neighborhood. He had made the mistake of walking home to his apartment from Penn Station some blocks to the south. Where the attack occurred is a location that this reviewer knows well. In my capacity as a medical editor in Washington, D.C., my morning cab driver and I pass the spot most weekdays shortly after 6:00 am in our ride to the station to go to my office in D.C. It is right opposite an old converted branch of the Enoch Pratt Free Library that has been renovated as the Village Learning Place in the 2500 block of St. Paul Street. I read a poem there not too long ago. Stephen Pitcairn’s killers were young African Americans. But then-neighborhood resident Reggie Higgins, the man who cradled Pitcairn as he lay dying from a stab wound to the chest, was also black. The killing left Charles Village, a multi-racial neighborhood with a high student population close to the Johns Hopkins University Homewood campus, stunned. Shirley Brewer attended a community vigil a few days after the murder and met Mr. Higgins, and was both shocked and captivated by the story. sleepless hours thinking of you. once more animated, curious, kind. the unimaginable agony of your death. your legs stiff from a long ride. to travel by foot the last mile home. your upcoming birthday with friends. penetrated the neighborhood we love. Reggie was all of us, on our knees in the street. we did not save you. You died in Charles Village. the moon wept, her face a mother’s wound. Yesterday, your family in Florida buried you. Did they spit out Baltimore? a warm place at our dinner tables. in each lovely Charles Village garden. a meal at the Paper Moon. of everyone who needs us. that night you carried your dreams. on this hazy, damaged world. brighter than a full Charles Village moon. on the half shell, a good joke. all the stops on my personal map. for one piece of chocolate cake? the light they lost when I died. the last word I spoke. . . .
when you took my life? skin and muscle, tore my young heart. like rabid dogs into the moon-carved night. possessions I had already offered. as I talked to my mom. into the cesspool of the world. gaze into the faces of mothers who loved you? the paths you followed? . . . This is poetry of grief and heartbreak but rendered with clarity, humanity, and touch of humor. After Words makes Stephen Pitcairn come alive and thus makes his loss all the more real to us, the readers. The book is a triumph. Highly recommended. If there is to be any criticism leveled at the book, it is this: to my mind, “Offering,” the opening poem that kicked off the series, the poem that appeared on Ms. Brewer’s blog and was later revised for the book, is not quite as good as the almost searingly insightful poems that follow. “Offering” is heartfelt and sincere but it is also telling in some aspects (“an awful / stab in our collective heart,” . . . “the unimaginable agony of your death”) — a trap that the later, more sophisticated poems avoid. “The first poem — ‘Offering’ — is the only one in my voice – and was written in the week after the murder, in the height of the emotion. It was intended at that time only for Stephen’s parents and family. The other poems came later, with the emphasis more on the craft. “The elements of After Words work together to tell a story. My introduction, Gwen Pitcairn’s dedication to her son, the two epigraphs, Stephen’s essay, the poems crafted in Stephen’s voice, in Gwen’s voice, in the voice of Reggie Higgins, and that of the moon, the tree, the knife — and the first poem that traveled from a poet’s heart to the heart of a mother in Florida who had just lost her only son. ‘Offering’ was a poem to Stephen – as much a raw message and correspondence as a poem. “In that sense, ‘Offering’ differs from the other poems. It established my relationship with Gwen Pitcairn — and a trust between us — that fostered the writing of the other poems. (E-mails of July 15-16, 2013 from Shirley Brewer to Chris George, quoted with permission of the poet). As I write, Ms. Brewer was due to read from the book at the Village Learning Place on Wednesday, July 24, 2013. It was certain to be an emotional evening. Shirley J. Brewer, a resident of Baltimore, Maryland, is a poet, educator, and workshop facilitator. In addition to her work being published here in the Loch Raven Review, her poetry has appeared in The Cortland Review, Comstock Review, Passager, New Verse News, Innisfree Poetry Journal, and other publications. Her poetry chapbook, A Little Breast Music, was published in 2008 by Passager Books. 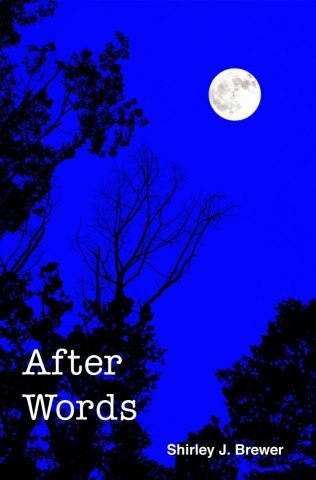 After Words is her second published chapbook. Christopher T. George is Co-Editor of Loch Raven Review. As well as being a poet, fiction writer, and freelance writer, Chris is a published historian who specializes in the War of 1812 and Jack the Ripper. Originally from Liverpool, England, he is a long-time resident of Baltimore, Maryland and is now a U.S. citizen. He lives near the Johns Hopkins University Homewood campus, Baltimore, with his wife Donna and two older rescue cats. We works full time as a medical editor in Washington, D.C.